The Electrical Mobility Calculator explores the Einstein-Smoluchowski relation (also known as the Einstein relation). This relation connects the random motion of electrons in a piece of wire (without a voltage difference applied) to a current flow through a wire (once a voltage difference is applied). Continue reading to learn about the Einstein-Smoluchowski relation, the diffusion constant, and the drift velocity. Electrons in a wire are in a constant, thermal motion. If we imagine putting all the electrons in a small region of a wire, the thermal motion quickly spreads them throughout the whole wire. The diffusion constant D tells us how quickly this happens. The unit of the diffusion constant is area/time. You can think about the diffusion constant in the following way. Say that, at some moment electrons occupy a certain area. The diffusion constant is the velocity of growth in time of this area. μ = u / V.
q [C] is the charge of the carriers. In a normal electric wire, the carriers are electrons, so the charge q is equal to the charge of the electron. The electron mobility in cooper at room temperature is about μ = 3000 mm²/(V * s). The resulting diffusion constant is D = 77.08 m²/s. As a second example, consider the sodium ions (Na⁺) in water. The electrical mobility is now μ = 0.0519 mm²/(V * s), which gives much smaller diffusion constant D = 0.001333 mm²/s. 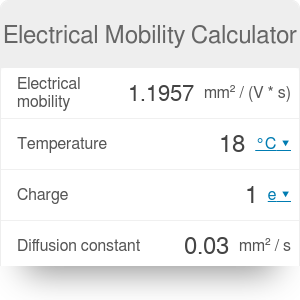 Electrical Mobility Calculator can be embedded on your website to enrich the content you wrote and make it easier for your visitors to understand your message.